Released in 1984, Baby Monty featured in the 20 game PCW Games Collection cassette and type-in book. You play the role of Baby Mole who has 'fallen from his shelf into a mega-dark cavern'...what an inspired back-story! After diving into an old boat your job is to raise the water level and row your way through the cavern while avoiding the tumbling barrels which have apparently escaped from an old arcade game. This is somewhat of a Donkey Kong clone with a very random story and terrible setting. There are 15 levels of increasing difficulty, and if you manage to complete them all it simply loops back to Level 15 with no sign of an end screen. I'm guessing this means poor Baby Mole is permanently stuck in the 'mega-dark cavern!' The lanes are very narrow in these higher levels and it's very difficult to avoid the random barrels as you reach the top of the screen. Without a variety of enemies or items to avoid you'll quickly tire of the repetitive gameplay. There's no music in the game to keep your interest and the limited sound effects can only be described as functional. Baby Monty is a very basic game and one that you'll likely play a couple of times and then forget about. 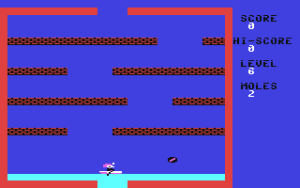 Random trivia: Baby Monty was one of the first games developed by Antony Crowther. He later went onto develop games such as Loco and Black Thunder, as well as creating the Monty Mole character with Peter Harrap.